The acronym IAPD stands for "Interactive Analysis of Paleomagnetic Data," and that is exactly what this program allows you to do. 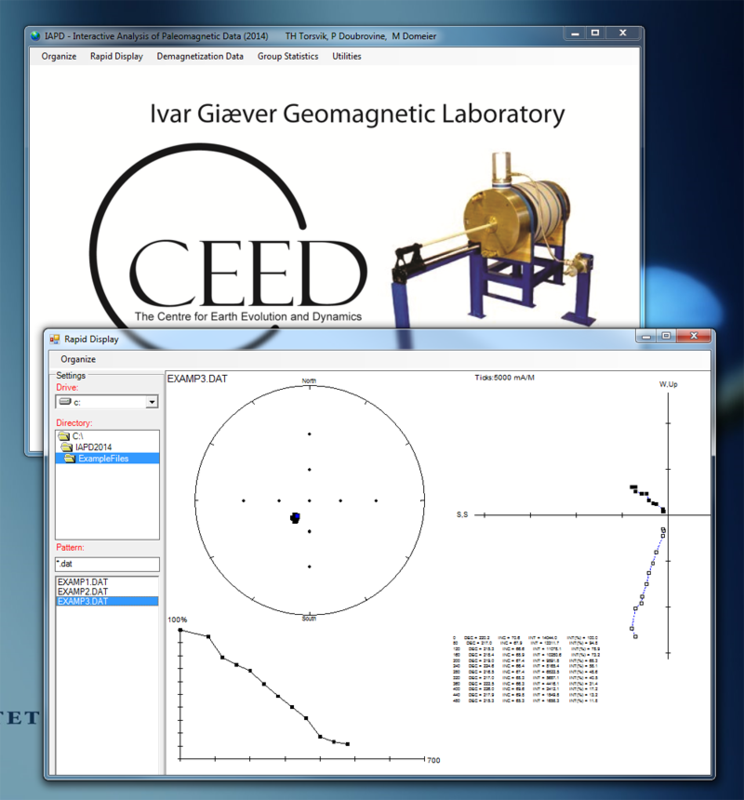 IAPD will take you through the analysis of demagnetization data at the specimen level, identification of characteristic magnetic components, calculations of site-mean directions and virtual geomagnetic poles (VGP), group statistics and field tests — all the way to the time-averaged magnetic directions and paleomagnetic poles. 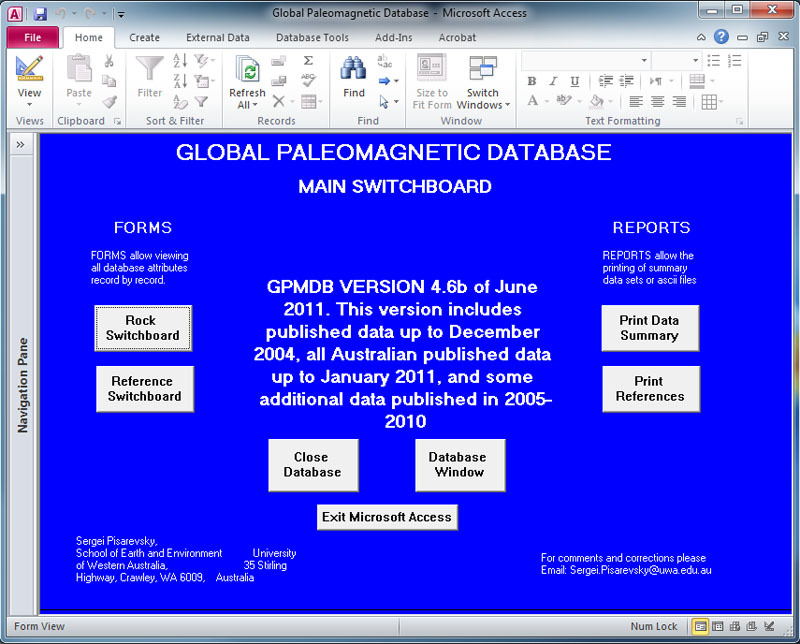 Simply put, the IAPD includes all necessary tools that a paleomagnetist may need in a single software package. IAPD 2016 was developed by Trond H. Torsvik, with some minor contributions from Pavel V. Doubrovine and Mathew Domeier. 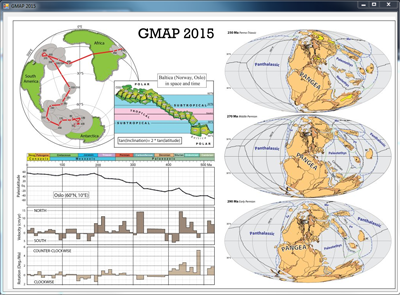 GMAP 2015 is a computer program that performs the processing and plotting tasks usually associated with presentation of paleomagnetic pole positions, and generation of paleogeographic reconstructions. Originally, the GMAP software was developed by Trond H. Torsvik at the University of Bergen (1982); the 2015 version includes later contributions from Lauri Pesonen, Mark A. Smethurst (Torsvik & Smethurst 1989) and Pavel V. Doubrovine. CEED is currently in process of developing advanced GIS-oriented reconstruction software for paleontologists, and BugPlates is a stripped-down version of our first software development. BugPlates operates only between 540 and 250 Ma but has a unique capability to interface with fossil databases. 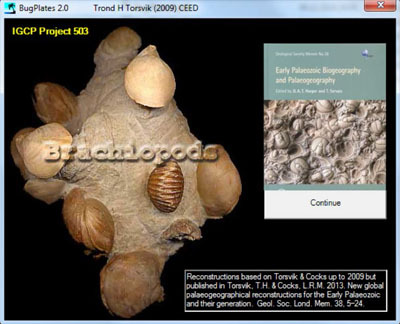 BugPlates was written by Trond H. Torsvik and is a part of the IGCP 503 Project: Early Paleozoic biogeography and paleogeography. Below you can find an admittedly incomplete list of paleomagnetic and rock magnetic software from our colleagues worldwide. As of June 2016, all software listed below was available for download, although some of these packages appear to be not maintained or outdated. Please let us know if something good is missing. GPMDB v. 4.6b is the latest version of the ever-popular IAGA paleomagnetic database that was released in June 2011 and includes a global compilation of paleomagnetic poles and directions that have been published up to December 2004, the Australian paleomagnetic results published up to January 2011, and some additional data published in 2005-2010. The database was originally created by Michael McElhinny and Jo Lock (1996), and later maintained by Sergei Pisarevsky. The GPMDB has been down for many years now, and the IGGL team, in collaboration with Sergei Pisarevsky (University of Western Australia), is committed to bringing it back to life by updating it with new paleomagnetic results. From 2016 on, new versions of GPMDB will be released on a yearly basis. Below is a list of publicly-available paleomagnetic and rock magnetic data resources. Please let us know if we missed something.